I close my eyes and visualize the Union Bakery on South First Street... I smell the sweet yeasty perfume, its freshly baked bread and taste that special mixture of vanilla, lemon, and cinnamon on the giant rolls and hear the echo of Italian voices, happily singing, joking, and planning their week-end and conversing in the most poetic language this side of heaven, Italian, as they end another work week. Not everyone has a safe, secure place to which they can retreat when life gets as hectic as it is today. The lucky few that do will not go mad with worry over the economy, the political mess, and a million other things that are really beyond our control. My safe place is an island in time. The l930's, right in the middle of that churning, angry ocean of despair, the Great Depression. It was the worst of times for the rest of the country, including many parts of our state, but for Old Towners, and Albuquerque, as a whole, it was a time of real hope, and they were better off than they had ever been. The city was growing. 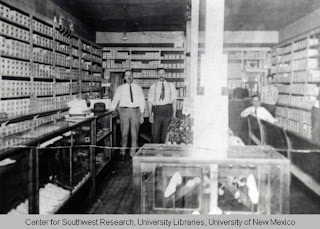 Grocery stores began popping up in almost every neighborhood, and in the business sector, General Stores, that carried every type of merchandise you can imagine, dry goods, feed, groceries meats, and poultry products, wholesale and retail. On the 300 block of North First alone, from Tijeras to Marquette street, Franchini and sons, Dino Bonaguidi, M. Vaio and Sons, the Tartaglias, the Masaglias, and The Bachechi's had large general stores but throughout the entire town, Italian names were prominent in businesses ranging from Ferraro's cigar store, to Bachechi's Paris Shoe Store. 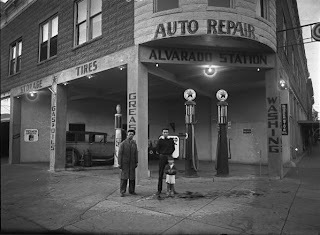 Bars, Pool halls, Service Stations, Garages, hotels, bars repair shops, and more were all owned and managed by Italians, and staffed by their families, who advertised in Spanish to attract a Hispanic clientele, whom they served in the Spanish language. If Albuquerque had changed it's nickname from "The Duke City " to "La Piccola Italia," in the 1930"'s no one would have objected. It was an Italian Town. The Priests were Italian, teachers were Italian, Politicians were Italian, businessmen were Italian, Nurses were Italian and Italians began to come here as patients because of the high and dry climate. A more complete history of the Italian Community is forthcoming when we get to the series dealing with La Colonia Italiana di Albuquerque, right now, the important point we want to make is that both Albuquerque and New Mexico survived the great depression without too much permanent damage by cooperating with the immigrant populations. 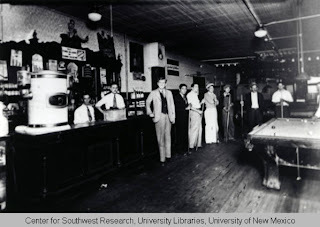 The Italians were not the only first generation of immigrants to New Mexico, there were others, but not as numerous and not as motivated as the Italians. The Jewish community, who also had a dog in the fight, because of the Jewish roots in the Spanish community, for instance, and it's difficult to tell about the Greeks, Lebanese, etc., but this writer is more familiar with the Italians than any of the rest. 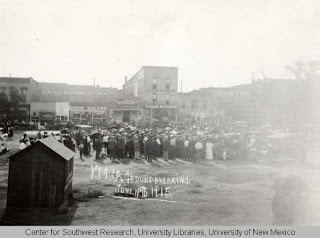 Jewish immigrants also fared better in Albuquerque, and, like the Italians treated the Natives and the Hispanic Communities differently, partly because of the already established Spanish-Jews, and Jewish owned trading posts, and pawn shops catered to "Indians" both on and off the reservation and bought from or hired Indians as their silver smiths and to do various other jobs. One full-blooded Jew even became a tribal chief. Pawn Shops and Indians had a different kind of business going for them, Silversmiths would pawn their work to a shop, who would store it and, with the craftsman's permission sell whatever would sell at a commission. The craftsman would pay interest on the pawn but could use it for special rites and return it, secure in the fact the jewelry he left at the pawn shop would not be stolen but it was, it was insured. Costs that the average craftsman cannot afford. The Town and the Town in Old Town grew closer and closer, now there was not only a linguistic and cultural tie to the Italian Priests but a genealogical relationship developed. Families that been assumed to be Spanish or Mexican were traced back to Italian origins. Italian priests and monks who became extra curricular MENTORS and advisors of boys who actively sought out their and companionship in hopes of some day becoming priests or monks themselves also helped them to find not only themselves., but long forgotten family roots that led them to Sicily and other Italian cities and towns. Many of these young Old Towners grew up and served in the armed forces during World War Two, and found information about Italian history after the fall of Rome, the Unification, Geribaldi, and Southern Italy, useful to both their own interests and those of the United States. Thanks for the section on Italians and the photos! I'm a descendent of the Sei and Monte families, which intermarried with most of the Italian families you listed above. 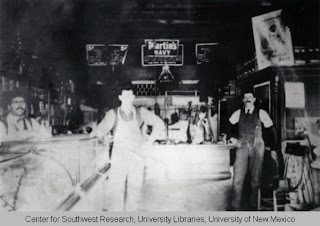 Pete Sei owned a saloon on First street. George Monte was a builder. Information about either family or possible resources to pursue would be excellent.